The library of amazing fantasy content grows every single month as we add more and more classic monster encounters and new exotic locations. PLUS once every two months we release a Pack of SoundSets completely supporting one adventure module or Pathfinder Adventure Path Chapter (currently "Hell's Rebels"). Keep building your library by remaining a subscriber! Every month we will be releasing two brand new shiny Sci-fi SoundSets. See our Release Schedule Details page to see all the amazing content we have planned PLUS in between, we release bonus content based on what users are asking for most loudly! Also, everything we release in the Board Game Player, you'll also own forever! What amazing value! Your subscription now also gives you complete access to the Syrinscape SoundSet Creator, allowing you to modify the SoundSets you own and build your own content from scratch. You'll be able to upload your creations to our servers and sync them across all your devices. 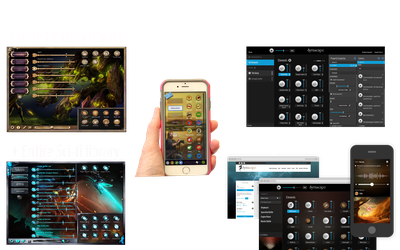 Your subscription also gives you access to community content build and shared by other Syrinscape users. Find out what content has already been built here and watch a short demo video. Users are busy creating and sharing amazing content for the whole SuperSyrin community, including Creepy Shop Keeper (everything you need to run a shopping trip for your PC's without uttering a single word), Tropical Jungle (birds, monkeys and humidity galore), and Battle of Wolven Pass (a field battle of epic proportions). Don't hesitate to contact Support, if you have any problems or questions about your subscription or upgrade. Plus, as long as you remain a subscriber the complete catalog of Syrinscape BoardGame, Fantasy and Sci-Fi SoundSets will be accessible to you, even the ones you haven't ever paid for. If we've made it, you'll be able to download and use it.